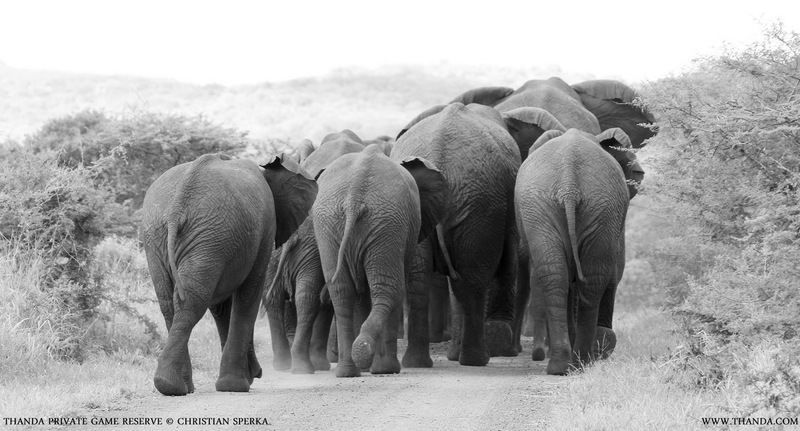 It is amazing how far Elephants move even if they take a leisurely pace. So following them if they move fast is quite difficult. The Thanda guests on my vehicle enjoyed the fast drive to catch up with these gentle giants when they were on the way to the next waterhole. And we just caught them as they crossed the road in front of us. I am getting married up in your neck of the woods shortly – actually not quite the woods – under the Marula Tree. Anyhow – I was thinking maybe you would like to attend the ceremony. Elephant children are most welcome! Please be gentle though. I do love you so much but remember that the bride is much smaller than you and please don’t eat my tree before my special day! Love Bridgid.